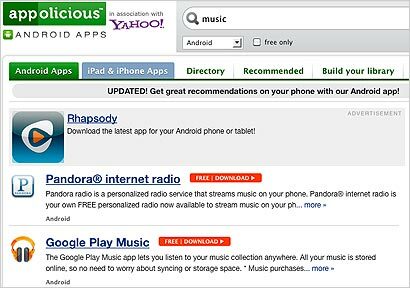 Mobile app directory Appolicious is launching a keyword-bidded ad platform for running relevant ads that appear on the search results pages on its own online and mobile properties and those of partners Samsung and Best Buy. The idea is to tap the search activity within these app discovery hubs to offer marketers a way to reach consumers who are “in-market” for apps, rather than already using an app. The new Appolicious Advertising platform allows advertisers to target ads based on keywords like “music” or “sports,” and pay on a cost-per-click basis. The ads run on the search results pages of Appolicious.com and its Androidapps.com AppVee.com sites, as well as against search results in the Appolicious Android app. Beyond its own sites and apps, the ads will display against search results in the Apps app on the Samsung Note, the 7-inch Galaxy Tab Plus, and in the app discovery section of Best Buy’s apps for Android and iOS devices. Appolicious charges a set-up fee of $1 per ad and requires a minimum CPC bid of 10 cents. The app search ads themselves appear at the top of a page and take the form of an 85 x 85 pixel unit featuring app icon with text -- up to 40 characters for the title and 200 for the body of the ad. Appolicious founder and executive chairman Alan Warms said mobile ad networks like AdMob and Millennial Media use sophisticated targeting to reach qualified consumers to drive app downloads. “The problem is, most of this inventory is inside games -- where most people spend most of their time. So you’re still trying to reach folks when they’re doing something else,” he said. By contrast, he says ads served through Appolicious’ platform will reach them as they are in the process of selecting an app. Warms was general manager of Yahoo News, Tech and Education at Yahoo before starting Appolicious in 2009. Since then, the startup has partnered with sites including Yahoo and Citysearch and acquired rival app information providers like AppVee. Appolicious last fall struck a deal with Best Buy to power the electronics retailer’s App Discovery Center for searching iOS and Android apps. It reached a similar agreement with Samsung. Between its own properties and those it works with, Warms estimates that Appolicious content reaches an audience of between 5 and 10 million unique visitors. He said the company plans to add more third-party partners to continue expanding its ad network. 1 comment about "Appolicious Rolls Out App Search Ad Platform". Rochelle Brooks from nesssweet.com, March 27, 2012 at 1:08 p.m.